Aquarian Drilling provides a comprehensive bore installation, reticulation and pump repair service. We have modern diagnostic tools that allow us to quickly diagnose and locate any problems with your reticulation system. We repair or replace pumps, reticulation controllers, solenoid valves, sprinklers and damaged pipe work. We also perform valve and cable location. Our services include, drilling new bores in the Perth area, repairing existing bores, water bore fault finding, new waterwise irrigation systems, reticulation repairs and all associated electrical work, completed by our in house contractors. No job is too small! We specialise in the installation, maintenance and repair of new and existing water bores for all of Perth – north and south of the Swan River. 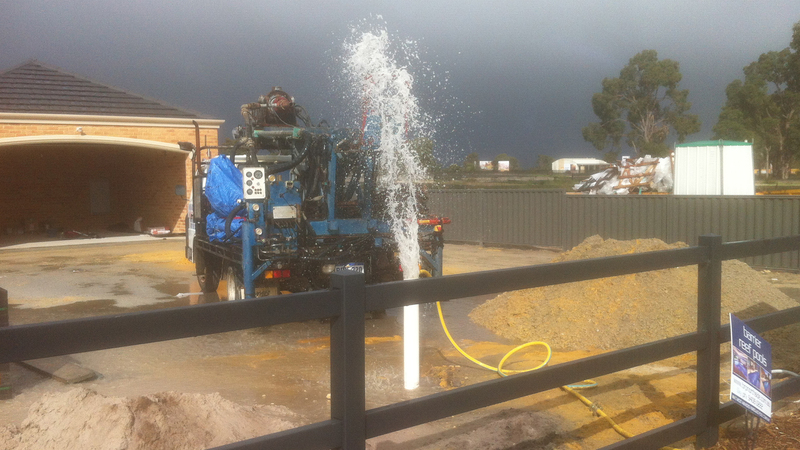 For nearly 30 years’ we have specialised in the installation of water bores for local Perth homes and businesses. We have a wealth of experience in drilling Perth metropolitan bores of all sizes and our local knowledge is second to none. There is a good chance that we have installed a bore or replaced a pump on your street! savings of a water bore. 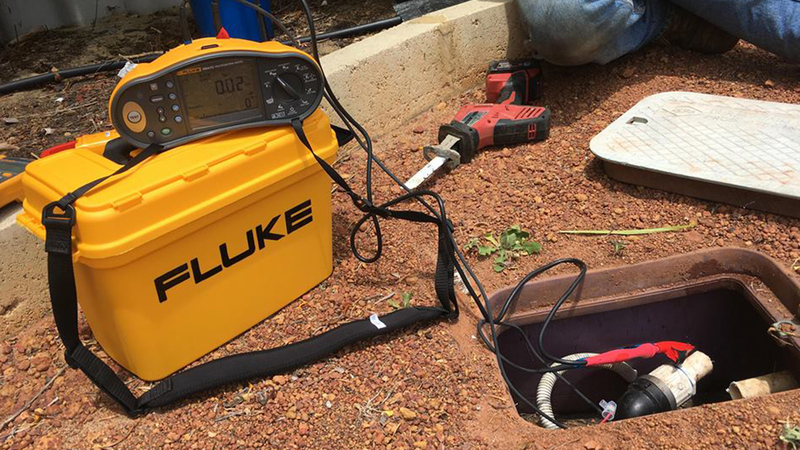 Our Specialist Bore Electrician can diagnose and repair any bore or reticulation system electrical problem. With over 15 years’ experience in the, drilling, water bore and irrigation industry in Perth, we can diagnose any pump related problem quickly and cost effectively. If your pump is fused our electrician can complete the paperwork to help with your insurance claim. With nearly 30 years’ experience in the bore water drilling industry, you can trust Aquarian Drilling to repair any and all bore water installation faults or errors. Our trained pump and electrical technicians have the experience to quickly and effectively locate the problem, ensuring your bore is fully operational, within budget. Our local knowledge and experience is second to none. We are a professional licensed drilling company with nearly 30 years’ experience installing new bores and solving bore and pumping problems in the Perth metro and surrounding areas. You can rest assured that we have the industry experience to diagnose a magnitude of complex problems. We only use the best equipment to drill new bores in Perth, and only install quality products on our customers premises, ensuring maximum reliability and efficiency for years to come. For this reason, we stand by our customers with a no fuss comprehensive warranty process. We are a family owned and operated business that is fully insured and licensed. Drilling and electrical contractors Steve Rowland (ADIA 217) and James Rowland (EC 13614). We provide value for money for all of our customers, across our range of bore water drilling and repair services, with very competitive pricing and discount for Seniors Card holders. Steve was right on time to my house, fixed the problem and the bore was up and running within 1 hour. He also gave some good advice when asked about how to extend the sprinklers to a new part of the the yard. Very reasonable (affordable) rate for the excellent job and advice. Highly recommended. Thank you Steve. I was more than satisfied with the service rendered by Steven Rowland. He was upfront on price - which I considered very reasonable given the other quotes I had received, He was very businesslike but at the same time most approachable and he completed the job thoroughly and competently He uses quality products designed to give best value for money. I have since recommended him to my friends and would not hesitate to contact him if I needed more work done on my property. Thanks Steven. Prompt, Knowledgeable & Reasonably Priced! Highly recommend the team at Aquarian Drilling, they were prompt, knowledgeable and very reasonably priced. Our reticulation problems were sorted very quickly. Messaged Steve after seeing his [advertisement] on gumtree and within half an hour he was at our place fault finding on our bore... Such great service which is hard to find these days, thank you so much. I will definitely be recommending you to others! We inquired into Steve's services after having troubles with our bore for a couple of months. Other company's had advised us that a re-bore was required to fix the issue however in actual fact Steve identified that the problem was the non return value. Steve was knowledgeable and able to fix the problem quickly whilst also saving us thousands. Would highly recommend him to bore or retic issues. Thanks again Steve! I have had the pleasure of dealing with Steve at Aquarians Drilling a few times now. The first was a quick phone call to trouble shoot an issue I had with my controller of which he fixed without a hassle over the phone. More recently our bore pump died and Aquarian Drilling were my first call without hesitation. Steve promptly came to diagnose, he was always without expectation of getting the job and eventually when we decided to get it fixed he was easy and no hassles to deal with. I would highly recommend Steve and his team. My wife and I had Steve come out and drill a bore for us in an area renowned for being tricky to drill. Not only did we find Steve's professionalism exemplary but he was friendly and a pleasure to deal with. We knew nothing about domestic bores when we started looking for one so we were really pleased that Steve took the time to explain things to us properly in words we could understand. Thanks Steve, we couldn't be happier with the finished product! I chose Steve because of the quality of his reviews and he didn't let me down. I highly recommend Steve for old-fashioned genuine service. He was really friendly and efficient. He diagnosed the problem with my bore pump and fixed it with a minimum of fuss and hardly any mess. And his price was very reasonable. It was a pleasure dealing with him. Thanks for the great service Steve. Steven attended my property as my bore/reticulation was not working. In no time at all he had troubleshot what the issues were and replaced the parts that were required. I found him to very professional and pleasant to deal with. I would not hesitate to use Aquarian Drilling in the future and will always recommend their services to my friends and family. Thanks Steven. Thoroughly Recommend Them to Anyone! Thanks again. Steve and the team at “Aquarian” went the extra mile. I am a pensioner in my 70s residing in Girrawheen and over the years, my reticulation system developed numerous faults that, none of the other contractors could properly fix. Steve was recommended to me by a neighbor and, unlike all the others, methodically worked through and fixed all of the issues. His work ethic was great and manners were impeccable, a rarity these days. The price fit my budget and I got real value for money. Thoroughly recommend. Thanks Steve for the excellent service we have used you for over 25 years now to manage the bores and reticulation on all our properties, can't recommend you highly enough. Very Professional, On time and Great Price! After being let down by another "recommended repairer", I contacted Steve at Aquarian. He Attended the next day on time and completed the Job. I would recommend Steve for all your bore and reticulation requirements. I've kept his business card so I can recommend him to others. He gave an estimate to complete the job and charged me at the lower end of the quote. Steve was great to deal with. He is a Tradie you can rely on. Outstanding, On Time and Very Reasonably Priced! Thank you Steve and James for a sensational job….. The difficulty with accessing/salvaging my centrifugal pump was that it was deep, very confined and considered somewhat dangerous – which was the reason other contractors either inflated their quotes or flatly refused the job. This did not in the least bit phase Steve who commenced work the following morning. The job took two full days and they even added some more reticulation pipes to the garden beds without any additional cost. Excellent Service & Very Prompt! Retic died Saturday evening, sent a message via Gumtree Sunday and Steve was here Monday. Gave me some good tips to help get the most out of my retic and fixed all the little long-overdue issues that Supaglue just couldn't fix any longer. Excellent price and a friendly, down to earth approach from Steve. No concerns about being ripped off or having any unnecessary work done. Prompt, Efficient and Pleasant to Deal With! No fairy stories, turned up as promised sorted out the problem very quickly had the bore up and running again, all other bore people contacted quoted a new bore required $6000 plus without an inspection. Would not hesitate to recommend Steve to anyone. Absolutely excellent service, highly recommend. Super quick response and repairs carried out just as quick.. Highly recommend, friendly, efficient and professional with a very reasonable price.. Would [definitely] recommend these guys! Steve and his son were both on time (early!) and very pleasant to deal with. They both got stuck in and worked like Trojans. They could have left once the bore was going, but they stayed and found a valve that I didn't know existed! They made sure everything was working well before they left. I am extremely happy with the result and I would recommend Steve to tend to any of your bore needs. Both Steve and his son have great integrity, a rarity in these times. Finally a tradie you can rely on! Steve and James came promptly and diagnosed the problem in minutes whereas others were talking pull up the pump and redevelop the borehole. Now we're back to normal and everyone's happy. Thanks Steve and James. Steve came over today at short notice to fix another guys stuff up the problem was picked up by Steve almost immediately he promptly identified that the pump was running in reverse he fixed the issue with ease & as if magic my bore was up & operational as quick as a flash I HIGHLY recommend this man for any bore work as he is not only highly knowledgeable but a true gentleman to boot cant thank you enough. THANKYOU THANKYOU THANKYOU!!!!!!!! Diagnosed and Fixed Bore Within Minutes! Steve and his son came to my house to find the problem with my bore. Other companies just wanted to drill and install a new submersible, but they had the problem sussed within minutes. His and his son's attitude are fantastic. Excellent service from people who know exactly what they are doing. No rip offs with these guys. I can't recommend them enough! Thanks a lot Steve!! Somehow Steve managed to locate the bore that I didn't know the location of as well as all of the electrics that were in the roof space. Within 20 minutes Steve had diagnosed the problem and rectified it - i was expecting a new bore pump at the least. What can I say? HIGHLY recommended service and thanks again. Chat To Our Friendly Team Today For A Perth Bore Quote!